Fred Moreno at his HUED salon in Eastwood. Contemporary Filipinos surely know the late German “Kuya Germs” Moreno, one of the country’s most successful TV and movie personalities and philanthropist whose advocacies have touched legions of Pinoys. MANILA, Philippines — His son, Federico A. Moreno built on the inspiration of his father’s initiatives in using showbiz to provide opportunities to aspiring young performing artists to shine and improve their lives. He, however, has employed entrepreneurship in effecting meaningful changes in other people and the country in general. Federico or “Fred” as he is popularly known, has been wearing many hats that banner the slogan and title of his father’s late night show: “Walang tulugan!” or No One Sleeps. The founder of Xcess Salon and Hued Salon, Fred, a board member of the Movies and Television Review and Classification Board (MTRCB), is currently the National Capital Region director of the Philippine Franchise Association (PFA) and chairman of the Marketing and Promotions committee of the Franchise Asia Philippines (FAPHL) 2019 slated on March 27 to 31 at the SMX Convention Center – Manila. Aside from being a mainstay of the salon industry, Fred also has a technology app company, a multilevel marketing and another tech company set to be launched soon. What really keeps Fred on his toes these days is his franchising business and the advocacies of PFA in creating job opportunities for Filipinos and growing the economy through franchising. This makes him an active spirit behind PFA, the largest and only globally recognized franchising association in the Philippines. His personal experiences made Fred a firm believer in franchising, the viable vehicle by which his Xcess Salon entrepreneurship, has seen steady growth and expansion. He is a certified franchise executive. “Xcess Salon now has 36 outlets, seven of them company-owned, and the rest are franchisees. This brand caters to the mass market, and the total investment ranges from P1.8 million to P2.5 million,” he shares. Fred put up Hued Salon to expand his reach to the A and B market, with the flagship outlet located in front of the Eastwood Mall in Eastwood City, Libis Quezon City. He targets to put up three more in prime locations, such as the Makati Central Business District, Bonifacio Global City, and McKinley Hill in Taguig City. 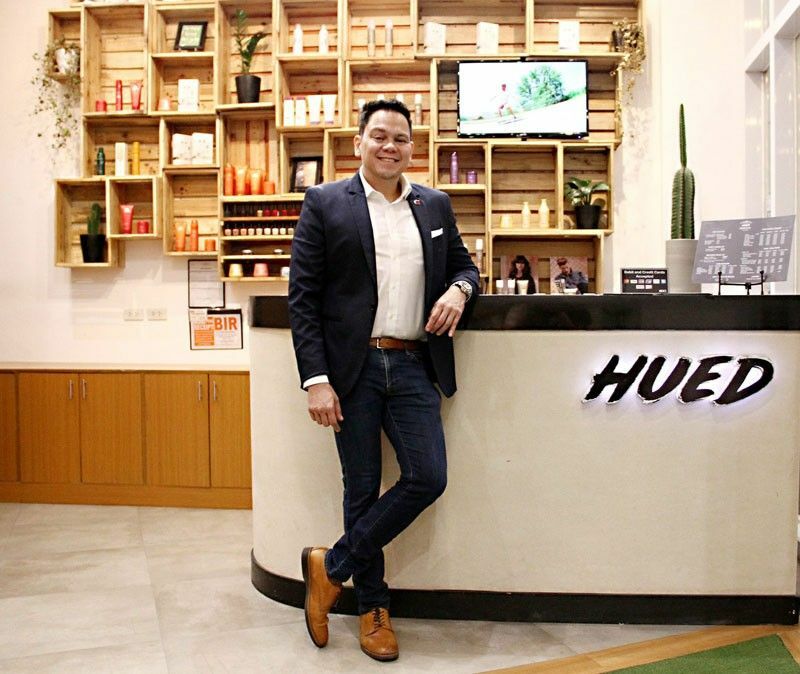 “We are still building the Hued Salon brand before we franchise it,” he said. Fred added: “I create concepts that are truly unique. Filipinos will really love it, even if it’s in a lower end market. We want to establish different brands of salon, under health and wellness, a spa, a hair academy, to make the Philippines the center of hairdressing in Southeast Asia. We are into detail; that is the secret nowadays. The market is very meticulous nowadays. You can open a salon, but there’s no assurance you will be different from the rest. The franchise executive stressed that his group wants to be in the mold of “eco-warriors,” which is why some of their interior furnishings and finishing are made of used crates disposed of by logistics firms in ports. They also have personalized coffee mugs, and, of course, the company is a staunch supporter of the lesbian, gay, bi-sexual and transgender (LGBT) community. “Our bean bags represent the millennials. We got rid of magazines, we got books instead, including children’s books. Our comfort room is gender friendly. It’s positive. That’s our vibe,” he said. In this year’s edition, Fred anticipates more international delegates both in the Franchise Conference and Franchise Expo, two of the four major components of FAPHL. “We have pavilions from countries like the United States, Canada, South Korea, Malaysia, Indonesia and Vietnam, among others,” he said. Fred said the camaraderie at PFA and the dynamism of its board of directors make its advocacies and projects sure successes. “Once you are in the group, you get electrified, the vibe. We have the “Cinco Hermanos,” we are all officers, we share ideas, we share everything – failures, accomplishments and achievements. We are very active in mentoring,” he said. Fred said his active participation in the PFA was his way of giving back to the PFA, especially with the good treatment he got from Philippine franchising pillars: PFA chairman emeritus and the universally acknowledged Father of Philippine Franchising Samie Lim and PFA vice chair Ma. Alegria Sibal-Limjoco, who’s currently the president of the Philippine Chamber of Commerce and Industry, among others – when he was still starting in the industry. “I remember back then when I was still a newbie in franchising, I had a personal chat with Tita Bing (Limjoco), this was about how PFA can help me and my brand back then. For SL (Samie Lim), every board meeting, it’s impossible for you not to pick up something from him; you will feel that mission and vision that he wants everybody to be imbued with. He makes sure everybody in the organization is in the same direction, which is nation-building. That is what he wants,” Fred said. Although he gives pretty much of his time to entrepreneurship, Fred continues to pursue the philanthropic works of his late father through the various foundations that were formed by Kuya Germs and those he was actively helping then. This is how Fred intends to make the “Walang Tulugan” legacy of his father live on.